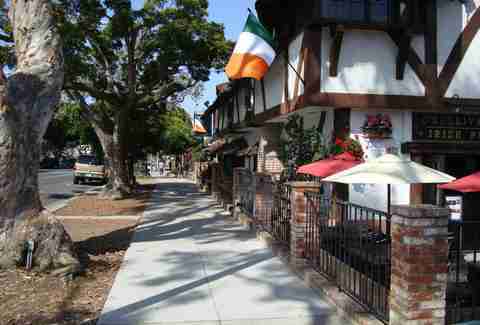 You'd be forgiven if Irish culture isn't the first thing that comes to your mind when you think about San Diego. Given our southern neighbors, America's Finest City is probably more associated with tacos al pastor than corned beef & cabbage. And that's understandable. But March 17 is St. Patrick's Day, a day when everyone gets to pretend they're Irish. As such, you should celebrate in appropriate fashion: with a cold pint of beer and good company. To help you do just that, we've picked out the five best Irish bars around town to celebrate good ol' Saint Patrick. And in order to determine these establishments, we asked an Irishman who would know: Daniel Drayne, owner of The Field, an Irish pub in the Gaslamp Quarter (and one we picked for this round-up), in an effort to discern what makes a good Irish bar in San Diego. 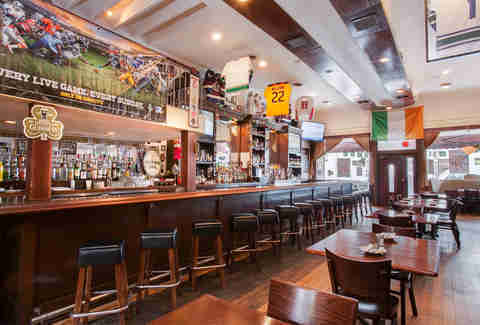 On his bar: "At The Field, we were one of the first Irish pubs on the West Coast to stress authenticity in our design. To build our bar, we had everything shipped here from Ireland piece by piece. And that's why we don't feel like some random Irish-American bar where it's simply an Irish pub in name only, with shamrocks on the wall and a Guinness tap." On Irish pubs: "When we talk about what makes an Irish pub great, there's a word we use quite a bit in Ireland: craic. Craic [pronounced basically like 'crack'], in Ireland, is like saying, 'What’s going on?' You know, what's the craic? What's fun, what's in the atmosphere, what's happening at that time -- craic encompasses all of that. So when you look for an authentic Irish bar, you look for that craic, so to speak." On St. Patrick's Day: "The first thing to remember when celebrating St. Patrick's Day is that it’s called St. Patrick's Day, and nothing else. Not St. Paddy's. It's celebrated a bit differently back in Ireland. In America, it's associated with going to the pub and having the drink. In Ireland, it's a religious holiday, our biggest national holiday. All schools and banks are off, and it's a way for families to get together." Take it from Drayne: "The Ould Sod is one of the only Irish bars out here that opened before us. It's going on 26 years now, and it's just as good as ever. It was one of the first Irish bars I went to when I moved out here, and it's still Irish-owned and -run. It's one of the few genuine Irish bars I'd go into. "If all that straight from an Irishman's mouth hasn't sold you, The Ould Sod features traditional Irish music on Tuesdays and karaoke on Thursdays and Saturdays. Plus, with its outdoor beer garden opening on Saint Patrick's Day this year, you can sit outside and enjoy a beer while feeling like you're in Ireland, minus all of the rain and gray skies." 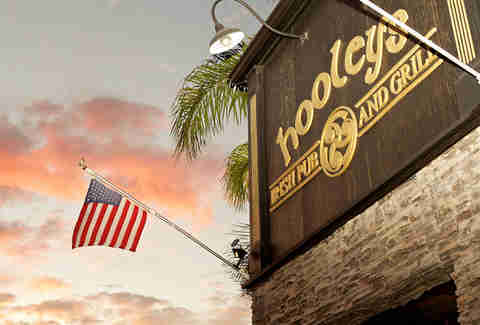 "The owner of Hooleys, he's been on the go a fairly long time and knows how to run a good Irish bar," says Drayne. "Like ours, most of his bar is imported from Ireland, so you have the authentic feel of being back home." Also, it serves corned beef tacos, and they're pretty damn good. If a place can somehow make the unholy marriage of Mexican food and Irish cuisine delicious, that's a bar you should visit often. "This bar hasn't been going for as long as some of the others in the area," says Drayne. 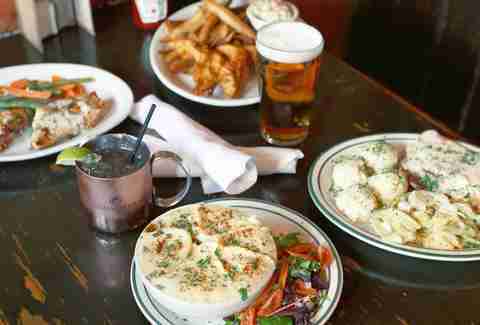 "I think they've only been on the go for a good 10 years or so now, but it’s a solid Irish pub. 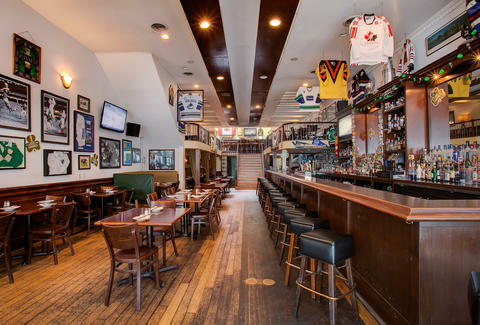 It's a good sports bar, they'll have whatever game you're hoping to watch on television, and most importantly, they have great craic behind the bar." As Drayne notes, Stout is a bit newer than some of the other pubs. Its menu reflects that newness with an eclectic mix of food, everything from pesto chicken (decidedly not Irish) to BBQ carnitas sandwiches (again, if you couldn't tell, "carnitas" is not an Irish word). Drayne didn't have much to say about the two O'Sullivan's locations other than that he stops by them when he's in North County and that they do a great job of replicating an authentic pub. Delving into the background of O'Sullivan's, it seems no stone has been left unturned in its quest for authenticity. Hell, the menu even features boxty (an Irish potato pancake), which, if you haven't tried, you should. Plus, with live music nearly every night of the week, you'd be hard-pressed to find a day when there isn't good craic at the O'Sullivan's locations. As noted above, Drayne's bar is about as real as it gets. It’s been around for 18 years, most of the waitstaff is from the Emerald Isle, and the kitchen makes a killer shepherd's pie. Plus, it shows actual Irish sports, like Gaelic football and hurling. Sure, you probably won't know what the hell is happening while you're watching, but there will be people cheering and cold beer. Does anything else in life matter? Robert Pursell is an East Coast transplant currently in Southern California bitching about traffic like everyone else. He likes beer and his jokes are terrible. Follow him @robert_pursell.